Thanks to what looks like a photo shoot of some kind, we're getting a detailed first look at the upcoming Chevy Orlando, a concept vehicle set for worldwide debut next week at the Paris Motor Show. The Orlando is based on the same platform as the 2010 Chevy Cruze and shares a lot of the interior and instrument panel styling elements. But when you go outside, things go a bit crazy. 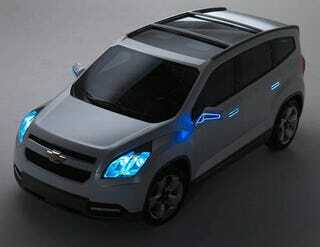 GM seems to have drawn inspiration from the movie Tron and given the Orlando a healthy dash of dramatic blue lighting. Check out the color-changing neon rings around the side-view mirrors and the rings around the door handles. We also don't exactly know what the heck is going on with the neon blue sunroof, but it sure looks futuristic, don't it? Maybe they should have called it the Chevy Lightcycle concept. We'll be bringing you the details on the what-for's on all this craziness as we get more info. For the moment, enjoy the early live look.